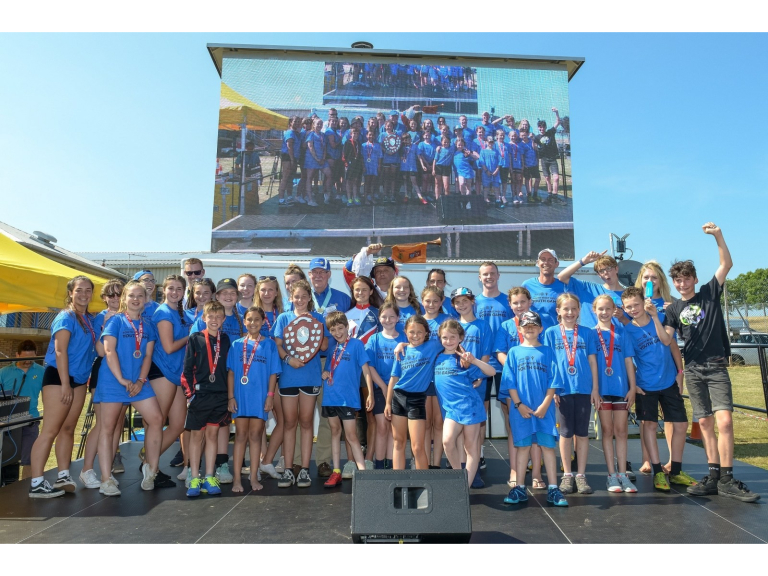 In glorious weather, young people from across Devon and Cornwall shone brightest at the South West Rotary Youth Games finals at Dawlish on Saturday 7 July. Around 800 participants aged 8-18 represented their local area across 13 sports at the South Devon venue whilst hundreds more families enjoyed a packed day of activities including food stalls, fun runs, archery, dodgeball, swimming and local bands all brought to a brilliant climax by watching England on the giant screen qualify for the World Cup semi-finals. Hosts Teignbridge took the overall trophy as the winning area for the fifth time, as the Games celebrated its 20th anniversary. 2016 and 2017 champions West Devon were second overall and South Hams placed third. Exeter collected the Chairman’s Shield in recognition of their improved number of participants and fair play throughout this year’s competitions. Saturday’s finals brings to an end this year’s South West Rotary Youth Games season which has seen Street Sports finals in Truro, Indoor Rowing finals in Plymouth and Netball finals in Paignton. There were also 120 GET INTO events during the year linking young people with local clubs and coaches to sports as diverse as netball, triathlon, hockey, cyclocross, rugby and dance. An estimated 10,000 young people have taken part in the overall journey to this year’s Games. Saturday’s event got underway with an Opening Ceremony led by Radio Exe presenter Chris Dinnis, and England and Devon rugby players Clara Nielson, Poppy Leith and Hollie Cunningham. Then the first medals of the day were awarded to the best performers in the ‘floss’ dance craze to send youngsters hyped and happy to their sports across the site encompassing Dawlish Leisure Centre, Dawlish Community College, Dawlish Lawn Tennis Club and Red Rock Youth Centre. There were also team medals for Torridge, who won bronze in the badminton and Torbay who placed third in the girls’ football, gymnastics, mini tennis and rugby. FULL RESULTS BELOW. Following a brilliant day of sport, the crowds settled down to watch England in the World Cup on a giant outdoor screen and at half time, the Closing Ceremony took place. Graham Carey, newly-elected Rotary District Governor and a member of Dawlish Rotary Club and GB cyclist and Games’ ambassador Lauren Dolan presented the awards to Teignbridge and Exeter. The day came to a perfect ending as England won through to the World Cup semi-finals among a cheering crowd of hundreds basking in the sun. Event organiser and South West Youth Games Trust Chief Executive Chris Broadbent said: “It was an incredible day for young people and their families from right across the region. We could not have organised such a day without the help of numerous volunteers including club representatives who ran various sessions, to the team coaches, umpires and referees. “Their help has enabled us to make a real difference to the lives of young people. We know from Saturday’s event alone that five new Girls Rugby clubs have formed. The Games are full of stories like that – it is a catalyst for local community sport leaving a legacy in all areas. We can build on this success for next year."